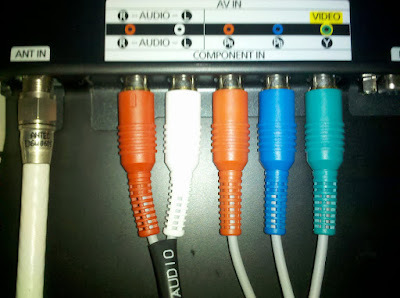 From left to right the plugs are red and white audio and red, blue, and green video. I’m sure there’s a great reason why the far right plug is green and not yellow but there you go. Here’s a Google search to get you started $g(green vs yellow video plug). Now, I only have to remember I wrote a blog post to recall the order of the connections.